is beautifully illustrated by Bill Papas, who exactly catches the joyous sauciness of the writing . During the sixties, Bill Papas was the political cartoonist for The Guardian, Sunday Times, and Punch Magazaine in London. 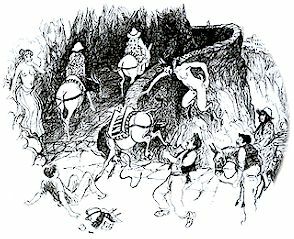 At the same time he wrote and illustrated innumerable children's books for Oxford University Press, several of which had Greek themes, as well as illustrating books by such luminaries as C.S. Lewis, Pope John Paul I, and Malcom Muggeridge for Collins Publishers. Bill and Tessa left Greece in 1983, lived briefly in Switzerland, and then moved to Portland, Oregon. Sadly, Bill passed away in the summer of 2000. 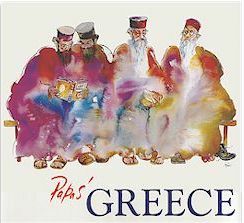 The most recent book produced by Bill and Tessa is Papas' Greece, a beautifully illustrated book that is an affectionate and humorous look at life in Greece during the seventies.